Platform for genetic engineering, and molecular and synthetic biology. Is there a better alternative to Genome Compiler? Is Genome Compiler really the best app in Medical category? 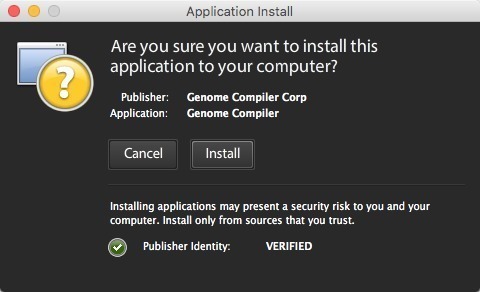 Will Genome Compiler work good on macOS 10.13.4? Genome Compiler is an all-in-one platform for life scientists which is free for academia users. Genome Compiler provides a set of intuitive tools for: DNA design and visualization, data management, sharing and collaboration, and seamless DNA ordering. It is available both online and in a downloadable version so you can easily access your data on Genome Compiler from anywhere you are. In addition, the software supports common file formats such as: FASTA, Vector NTI, SnapGene, Geneious, Clone Manager, Serial Cloner, Plasma DNA, ApE, DNAStar, etc. Genome Compiler needs a review. Be the first to review this app and get the discussion started! Inside Genome Compiler's Materials Box you can access thousands of sequences, plasmids, and parts from different repositories such as: Addgene, Sigma Aldrich, Synberc, Lucigen, iGEM, Plasmapper, an integrated NCBI search bar (that allows you to instantly import your data from NCBI), and more.